– What’s that medicine he’s been taking? – Stomach medicine. He always slurped his noodle bowl to the bottom, but lately, he barely touches it. – Plain noodle soup. In all these years, I’ve never seen him eat anything else. That’s what his colleague said. 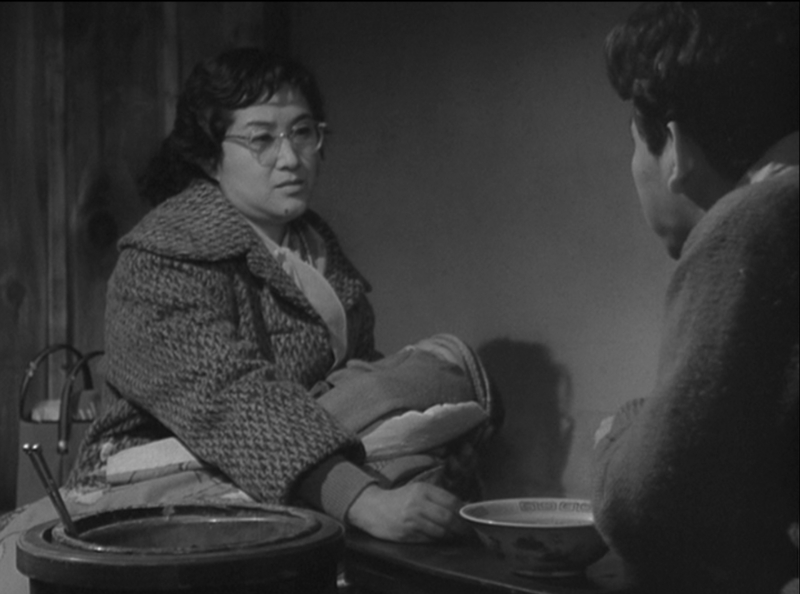 Kanji Watanabe, our protagonist in “Ikiru (1952)“, always slurped “plain noodle soup” for decades. In Japanese, his favorite “plain noodle soup” is called “U-don Kake”. There are three different kinds of noodles in popular Japanese cuisine: ramen, soba and udon. All of them are served basically in the same manner. Noodles are immersed in hot soup, or noodles are served chilled with a cup of liquid dip. 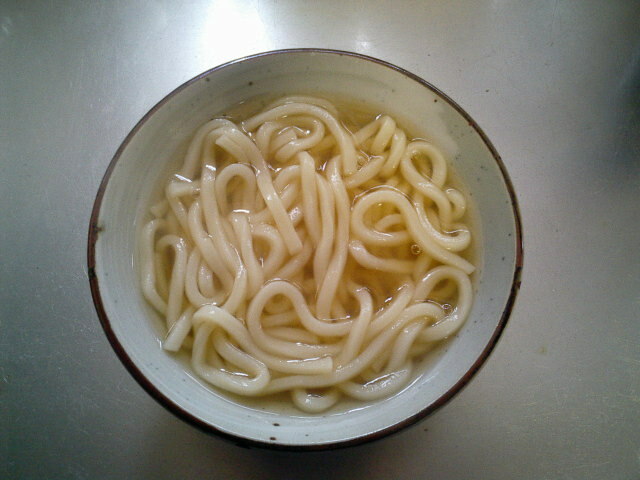 Udon Kake is udon noodles served in a hot soup without any topping. Udon Kake is a rather curious name. Many of us today think twice before realizing it may be an obsolete name for Kake Udon. It seems the expression was popular during 1930’s and 40’s. Looking at this scene, we notice that everyone in this office seems to bring his or her own lunch box. The conversation suggests that Watanabe must have his Udon Kake, the cheapest lunch menu, delivered to the office. This alone highlights Watanabe’s disinterest in epicurean delights. Also, udon is light and easily digestible meal since it mainly consists of carbohydrate and little fat. It is widely considered even suitable for toddlers. Watanabe might have had stomach condition for quite a while, preferring Kake udon to noodles with fancy toppings such as tempura or poached eggs. In Kurosawa’s films, ‘eating’ often measures the intensity of the person’s life. A person with a strong will to survive devours food like a staving animal. Odagiri in “Ikiru”, Kikucihyo in “Seven Samurai“, Murakami during the undercover mission in “Stray Dog“… while one without hope seems to have no interest in eating. 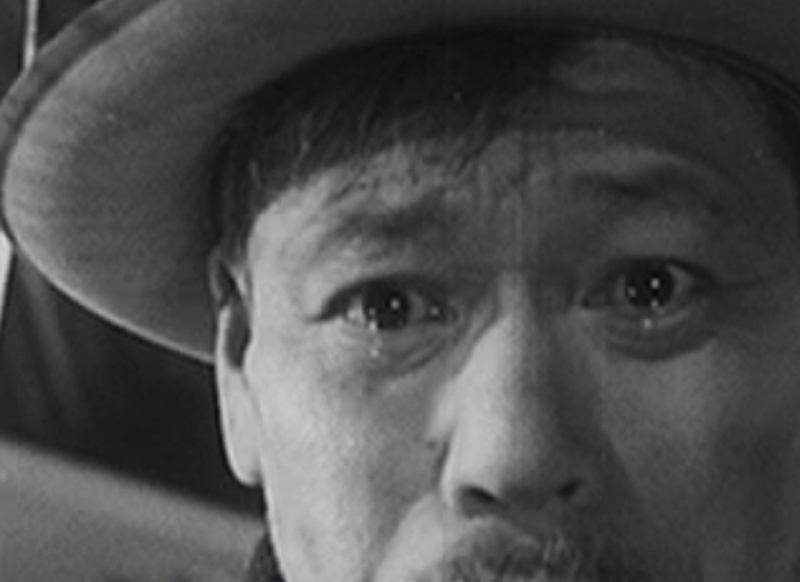 Matsunaga, a sickly gang in “Drunken Angel” and Kanji Watanabe in “Ikiru”. Ah, here is our protagonist now. But it would only be tiresome to meet him right now. After all, he’s simply passing time without actually living his life. In other words, he’s not really even alive. Some popular writers have exploited this simple meal – Kake-Udon or Kake-Soba (Soba noodle soup with no topping) – as a melodramatic device to appeal reader’s compassion. Usually, this cheapest menu you can find in any backstreet restaurant is described as a last resort for a family with uncertain future. An unimaginative writer would write up a scene in a dimly-lit battered diner – a kid slurping this noodle and asking “Mom, when can we meet Dad?” or something like that. 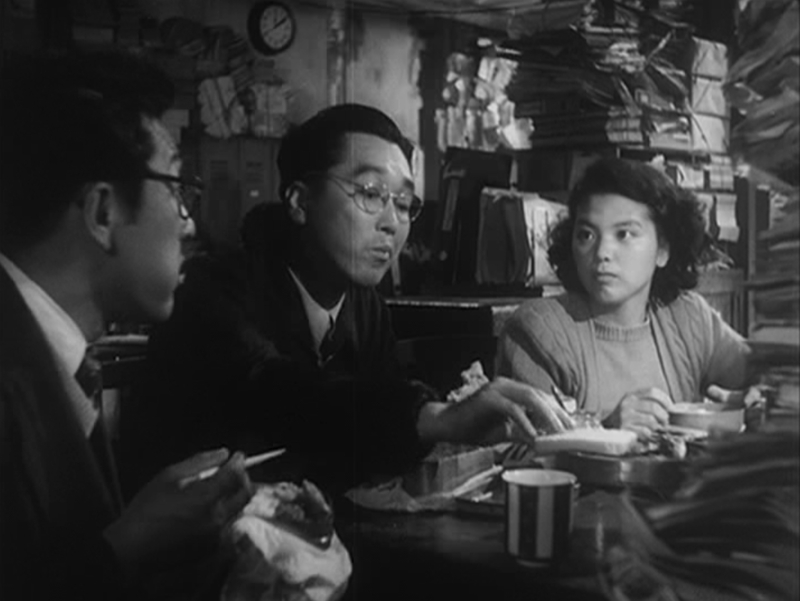 When Mizoguchi pictured a family with uncertain future in a dimly-lit battered diner, he twisted melodramatic self-pity into a grotesque proportion in his last film “Street of Shame”. Hanae and her sickly husband eat two bowls of ramen (apparently with no topping) after her hard day’s work in the “whore house”. They can’t afford proper medical treatment except for the occasional medicine. Her husband dolefully rejects taking more medicine because ‘it won’t make any difference’. Their conversation suggests they once thought about triple suicide (with their new-born baby) out of despair. But, during that conversation, her husband gobbles up his ramen, and then her ramen when she offers it to him. Exchange of little gestures, – her handing the bowl toward him silently, and without a word, he starts eating as if it is his – suggest eloquently about their relationship and their state of mind. They are afraid of future, or in despair, but their appetite never lie. Both Kurosawa and Mizoguchi saw modern men’s spoiled self-pity in a bowl of noodle soup.